Welcome to website of our stylish cottage in Benešov near Broumov. The cottage is available to fully rent it all the year round. 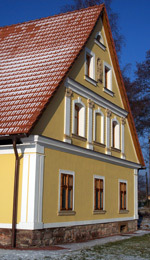 This historical house was built in the year 1851 and among the years 2005 and 2007 was stylishly fully rebuild. Accommodation capacity is 6 people. The pictorila countryside of Broumov valley offers a lot of turisticaly interesting places. Nature, history and sports lovers come into one´s own in that region. We are looking forward to your visit and we believe that you will spend here pleasant time.